Some smells may make you wrinkle your nose, but don’t actually mean anything is wrong with your system. Those include smells like mildew, dirty socks, rotten garbage, and stale cigarette smoke. Both mildew and dirty sock or stinky feet smells suggest that water is collecting in your A/C system that shouldn’t be there. Stale cigarette smells generally mean your coil needs to be cleaned to get rid of scents left when someone smoked in the house. And finally, the cause behind rotten garbage smells can be gross, but not generally harmful. Often, especially during winter, small injured animals may find their way into your air ducts when seeking shelter. If that animal dies and begins decomposing, it can produce a powerful rotten garbage smell. Your heating and cooling system isn’t likely to be damaged, but you’ll definitely want to call your local HVAC service to safely clear out your duct. The smell of old cigarettes isn’t really one to worry about. On the other hand, if your air conditioner smells like something is currently burning, this may be a sign that something is going wrong mechanically. Turn your system off immediately, as this could be the warning sign that an electrical fire could be coming, then call your local air conditioning service for help. If you’ve ever smelled an egg after it’s gone bad, you know exactly what we’re talking about; it’s a distinctive smell. However, rotten egg smells may mean more than a dead fridge — it could also mean a gas leak. If the rotten egg smell is coming from a vent or the utility closet, get everyone in the family, grab your pets, and head outside. Call the gas company first to come check out the leak, then call your local HVAC service to come check your system and ductwork. These distinctive scents also signal that something funky is happening somewhere in your A/C unit or ductwork. Sewage smells suggest that a sewer line has backed up or burst, and methane gas is collecting in your ducts. Gunpowder smells suggest that an electronic component like a fan motor or a circuit board has shorted out. Exhaust fumes throughout the house may mean an engine fluid leak. 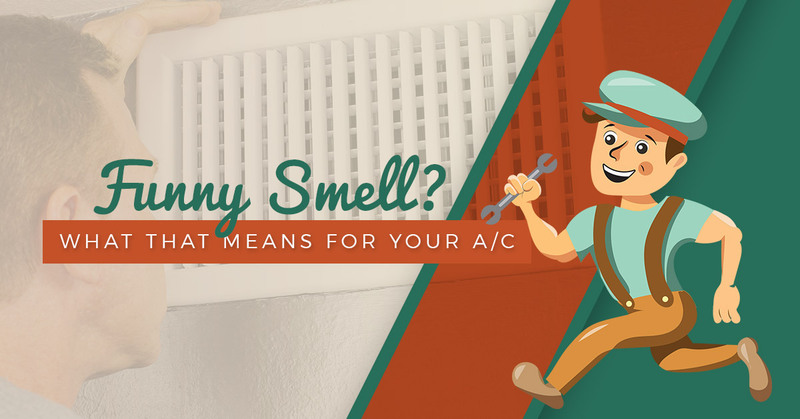 If your A/C smells like any of these potentially dangerous smells, be sure to turn your system off and call your local air conditioning service. For help in Lee’s Summit and the surrounding areas, call the Comfort Prost Heating & Cooling team today.